Are the measurements for this bar stool exact? No, the dimensions of this bar stool are nominal and may vary slightly due to the coating and seat type. 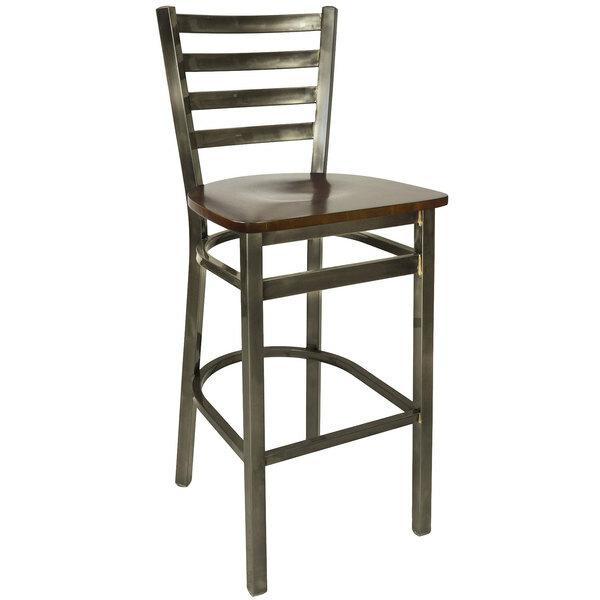 Whether patrons are cozying up to your bar at happy hour, indulging in a delicious breakfast, or watching the world pass by in your window-side dining area, this simple yet attractive BFM Seating 2160BWNW-CL Lima steel bar height chair is sure to present them with a comfortable place to perch! Its backrest boasts a ladder back design to provide unmatched comfort and support while adding a distinct visual appeal to your restaurant, cafeteria, or game room. In addition, a clear coat finish is applied to the sleek, steel frame, allowing for unparalleled durability and protection against scratches and scuff marks. The walnut wooden seat is contoured for exceptional comfort, and cleaning it is as simple as using warm, soapy water. Its steel legs are all connected with supports to ensure superb stability, while white nylon glides are capped on the bottom of the legs to protect your floors for years to come.